Overview: All know that the Delhi NCR is a treasure trove for history lovers and my visit was filled with interesting findings. I had heard about several Baolis, or Stepped wells as they are called, built in a very artistic way, and built by the Chauhans, the Lodhis, the Tughlaqs and later learnt by the Mughals too. We explored Agrasen ki Baoli, right in the middle of the city, close to Jantar Mantar. This Baoli is a three level stepwell, built initially in the 10th century by king Agrasen, later renovated by other kings. The next Baoli we visited was within the Purana Quila, which is a narrow stepwell, dates back to the 15th century, during the time of Shershah Suri. Rajon ki Baoli: A very royal Baoli lies inside the Mehrauli Archaeological Park built in the 15th century during the rule of Sikandar Lodhi. Its a pretty stepwell, with a wide walkway surrounding the well, and decorated by beautiful stonework on the windows. Gandhak ki Baoli: Adjacent to Mehrauli Archaeological Park is the Gandhak ki Baoli. Nothing fascinating about this stepwell, but it is a vast area, with the size of a swimming pool. This Baoli dates back to 13th century. Ferozeshah Kotla Baoli: A unique circular shaped Baoli is present inside the Fort, however, the Baoli is fenced and there is no way to get inside. Lodi Era Baoli, Dwarka: Hidden inside the modern area of Dwarka is the ancient stepwell, though recently discovered during excavation by ASI and INTACH. This Baoli is a stylish structure, looks like a miniature version of Agrasen ki Baoli. 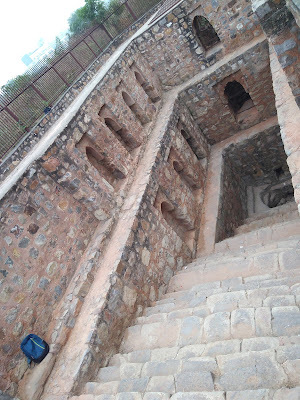 RK Puram Baoli: Located inside the locality of RK Puram is the Baoli, also known as the Munirka Baoli. This Baoli, which is one of the least visited, is surrounded by Lodhi Era monuments on its eastern side. Red Fort Baoli: On the south western end of the Red Fort is the Baoli, a simple structure similar to RK Puram and Dwarka Baolis, and is again one of the smallest stepwells in Delhi. These are a few Baolis which I have visited, however, there are some more which are present in Delhi NCR waiting to be explored. Nice to know about these Baolis.